The Wasserkuppe is 950 m high and the highest mountain in both Hessen and the Rhoen region. 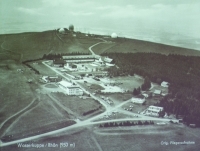 The Wasserkuppe is historically significant most of all in association with the invention of gliding at the beginning of the 20th century and also on account of its strategic position in the Cold War era. Current types of flying sports like para-gliding and hang-gliding also make the Wasserkuppe a special place between heaven and earth. The task is to design a central building concerning the subject of flying, which lies in the airfield's vicinity and shall allow a panorama over the Rhone region and Hessen's mountainous countryside. A wide-spanning hall has to be planned, which offers space for changing exhibitions and an auditorium for lectures, a "media laboratory" for developers and visitors, as well as a cafeteria and a check-in counter for sightseeing flights and parachute jumping. An open-air stadium for flying events can also be provided on the hall's roof, depending upon the design. The construction shall be devised in relation to the surrounding landscape and reflect the subject of flying. Spatial perception that will be changed by mobility is the starting point for design considerations. László Moholy-Nagy, who taught at the Bauhaus, characterized the pictorial description of "spatial fluidity" in flight when civil aviation began in the middle of the 1920s: this was a pictorial description that is being taken up again seventy years later in "liquid design" under the pressure of digital technologies. "The limits become liquid and the space is recorded in flight: there is an enormous number of relationships. The aircraft has a special task in this association: new views emerge when looking out of the airplane, as well as from the depth to the height. However, the most essential point for us is the view from the aircraft and the full spatial experience because it overshadows all previous architectural ideas." Moholy-Nagy complained about an architecture of relations, starting from the new spatial experiences with modern means of transport: "One formerly created closed bodies from visible, measurable, well-proportioned building dimensions which one called spatial design; present spatial experiences are based on the inflow and outflow of spatial relationships which simultaneously penetrate the often invisible effects of powerful relationships from inside and outside, as well as from above and below, which are given in the materials."